Item # 312311 Stash Points: 995 (?) This is the number of points you get in The Zumiez Stash for purchasing this item. Stash points are redeemable for exclusive rewards only available to Zumiez Stash members. To redeem your points check out the rewards catalog on thestash.zumiez.com. Complete your look with tropical vibes in the Rawr Crew Socks from Empyre. 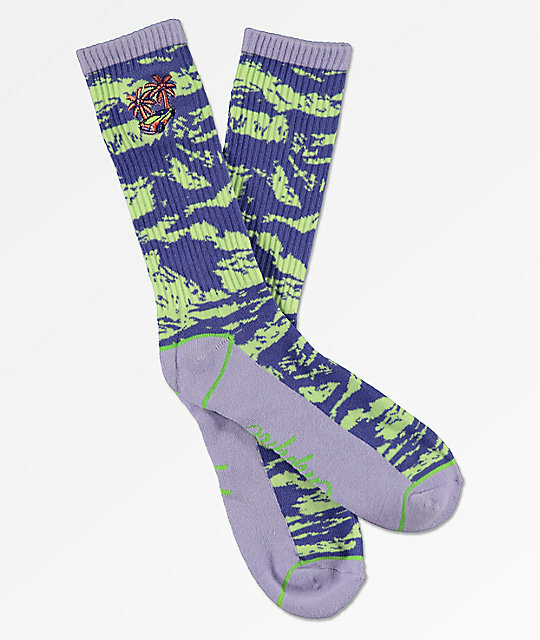 Coming in a purple and lime green colorway with abstract jacquard knit patterns throughout, these crew socks are a fun addition to any wardrobe. The design is complete with an embroidery at the upper cuff, featuring two palm trees and a luxury car, creating a look that you'll love. Rawr Crew Socks from Empyre. Purple & green jacquard knit pattern throughout. Embroidered car & palm trees at the upper. Jacquard knit logo script on the footbed. Padded heel, toe, and footbed. Fits men's shoe size(s) 9-13 US. 55% nylon, 25% cotton, 20% spandex.